Captured, beaten-down, forgotten, and left to suffer and die in a ruined temple, the Dark Angel has broken free to seek vengeance on his captors. 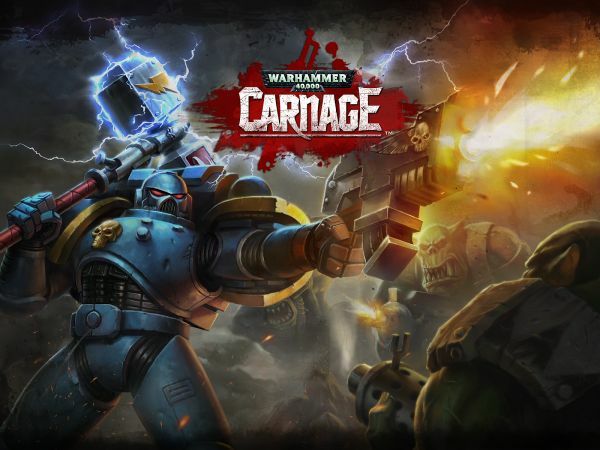 Play as the new Dark Angel Space Marine, equip the all-new Plasma Gun to obliterate multiple Orks at once, and blast your way through exclusive new missions that feature the new Arena Combat gameplay. The Dark Angel Update also introduces Wargear Supply Caches to Carnage, offering players a chance at the most powerful Wargear on Mithra. Supply Caches are obtained through completing Missions or using Gold. A wealth of new Wargear has been added, including many incredible additions of the highly coveted, top-tiered, Master Crafted weapons, each with unique abilities that cause devastating damage. The new Arena Combat Missions, exclusive to the Dark Angel, will have players surrounded by Orks rampaging from all sides – players will have nowhere to run. amounts of new Wargear and Supply Caches weren’t enough, the Dark Angel update also includes many game and performance optimizations, as well as new Wargear and Campaign Screens. Get ready to unleash some intense Carnage. PLAYWITH Interactive has announced the global launch of its "Hyper Casual" title, Hunter King, on iOS and Android. NEXON is is rolling out major content updates for 3 of its most popular F2P mobile RPGs. Weekly Recap #166 Dec. 9th - Blade & Soul, War Thunder, Trove & More!